Preheat oven 350 degrees. Melt 1/2 of butter in the skillet and cook squash, zucchini, and onion until crispy tender. Stir in garlic and cook for a couple minutes more. Turn off the stove and stir in corn, and next ingredients using only 1/2 cup of the breadcrumbs, until well blended. Spoon mixture into a 9 x 13 baking dish. Melt the other half of butter and stir in 1 cup of breadcrumbs until well coated. Spread mixture over top of casserole. Bake for 45 to 60 minutes until golden brown. Let stand for 15 minutes before serving. If you don't want to use butter to saute the veggies, I use just a little bit of olive oil. I also use Lite cheese, sour cream and mayo to keep down the fat. You need a little bit of fat in this casserole for it to cook well. 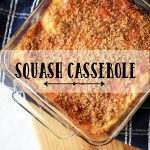 I have also only used squash in this recipe.